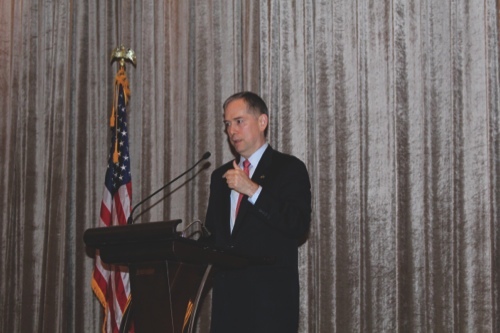 The U.S. consul general in Hong Kong and Macau, Clifford Hart, believes that the freedoms enshrined in the MSAR’s Basic Law are crucial to ensure its prosperity. “Macau’s established freedoms of expression and assembly have been and will remain critical to the SAR stability and prosperity. They’re memorialized in the Basic Law. We look forward to them thriving in Macau in the future,” he stated in response to the recent campaigns pushing for greater democracy in both SARs. Clifford Hart spoke to reporters after a luncheon organized by the American Chamber of Commerce in Macau yesterday, in his first public address since he took office here last year. The U.S. diplomat believes this is a positive direction for Macau, where the gaming industry has led to an economic resurgence. The role American companies have played made him proud. “I am proud that U.S. investors have played a significant role in Macau’s recent prosperity, and their continuing success is critical to Macau’s ability to attract additional foreign investment,” he said. Asked to comment on gaming concession renewals likely to take place after 2020 onwards and what type of role U.S. companies will continue to play, Clifford Hart said he’s not in place to make a forecast, but said that the role of U.S. companies in Macau’s gaming industry will surely be decided through a dialogue between government and operators. Clifford Hart said the Consulate General is committed to working with his counterparts in the Macau government, and in the private sector, to further explore two-way trade as well as investment opportunities. The U.S. consul general highlighted America’s continuous cooperation with China, particularly on the Pearl River Delta integration. Clifford Hart told reporters yesterday that such cooperation is predominantly strong in the private sector, as U.S. construction, engineering, legal and public affairs firms have been involved in various ways in this region. “This is a massive undertaking and a historical one (…) when the Hong Kong-Macau-Zhuhai Bridge opens, it’s going to be a game changer. There’s cooperation that is on going; it will depend on decisions by local interests and see who’s going to be the best provider. In many cases, I’m happy to say that American firms have been selected and there’s a great dynamic for the years to come,” he stated. Cooperation and close dialogue addressing pressing matters such as human trafficking or money laundering is also part of U.S’s strong commitment to combat criminal activity. “I mention the leadership role that U.S. business can play in combating illegal trafficking because it is a high priority of mine and of the U.S. government. It must be part of your broader role as leaders in this community,” he stressed in his speech. Clifford Hart met with the Chief Executive, Mr Chui Sai On, while he was in town. He took the chance to congratulate him on his success in securing a second term. They have agreed on the importance of bilateral cooperation, as well as the advancement of common interests. The U.S. consul general said that one of the consulate’s priorities in Macau is obviously to provide support to an estimated 4,000-plus U.S. citizens living in the region.